It is surprisingly difficult to capture the true colour of this flower in a photograph: the pink has far less of a blue component than that of Red Campion Silene dioica and is more like the bubblegum that many of us chewed as children. 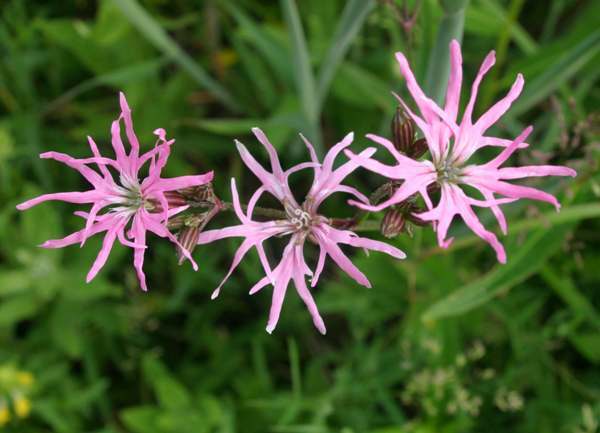 The pink flowers are 3 to 4cm across with five petals each deeply divided into four narrow lobes; this gives the flowers an untidy, ragged appearance - hence the common name Ragged Robin. Stems of Ragged Robin are hairy and can grow to 80cm in height, and the untoothed opposite leaves on the upper stems are stalkless, narrow and lanceolate, with a few spoon-shaped stalked leaves lower down. The leaves are rough to the touch. Although it is quite a common wildflower Ragged Robin is rather localised in Britain and Ireland. We have seen it in many parts of northern and central mainland Europe including Slovenia. 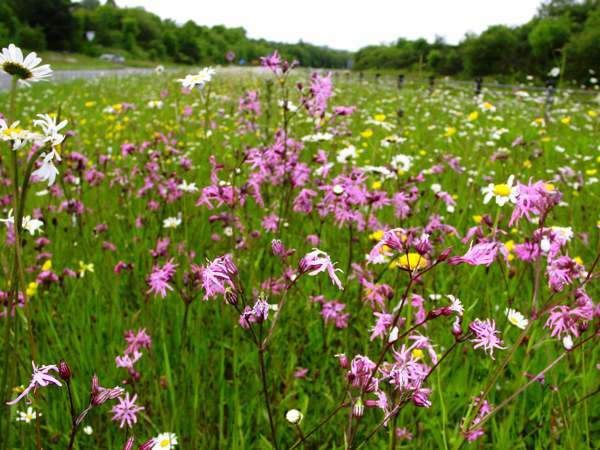 Ragged Robin usually inhabitats damp or marshy areas, although once established it seems able to grow surprisingly well even on some dry and exposed roadside verges. In marshy locations this plant often spreads across large areas, but for the most part it is more sparselydistributed than its relative Red Campion. In Britain and Ireland this lovely wildflower is in decline due to land drainage, which has destroyed much of its favoured marshy habitat. This aptly named wildflower produces its ragged and often rather bedraggled-looking blooms mainly in May and June although a few flowers sometimes hang on in damp, shaded spots through July and sometimes into early August. Lychnis, the genus name, comes from the Greek noun lychnos, meaning lamp; it refers to the use of a plant in this genus as the wick of an oil lamp. 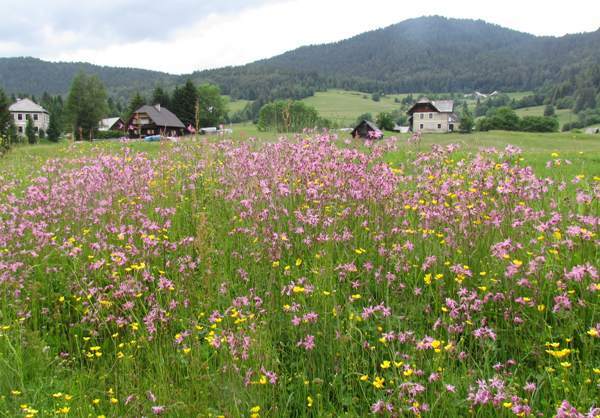 The specific epithet flos-cuculi means 'flower of the cuckoo' and was probably chosen because the first flowers of Ragged Robin appear just as the first cuckoos are being heard (in Britain and Ireland at least) in May. 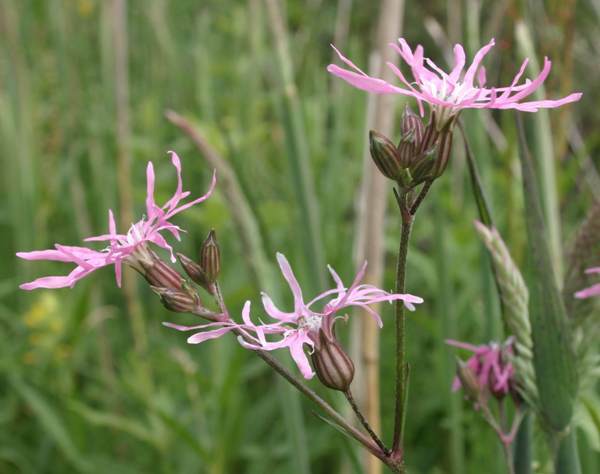 Ragged Robin is sometimes planted beside garden ponds for its ornamental value. Seen on the left is the display of Ragged Robin beside our own small garden pond in West Wales; the photograph was taken in June 2014. The roots of these wildflowers are a source of saponin, a soap substitute than can be used for washing clothes or as a shampoo etc. Saponin is toxic, although not readily absorbed by the human body; it affects some creatures more than others and has in the past been used by hunters (and probably poachers) to stun or even to kill fish in ponds and small streams. Occasionally you may come across an all-white variety of Ragged Robin, but pale to mid pink is more normal. From a distance Ragged Robin is easily mistaken for Red Campion Silene dioica, which has broader petals each with a single narrow cleft. Red campion grows in generally drier habitats such as under hedgerows and on woodland edges. Silene colorata is a Mediterranean species with smaller pink flowers that are more deeply notched; it also has a less robust growing habit and favours dry sandy soil. 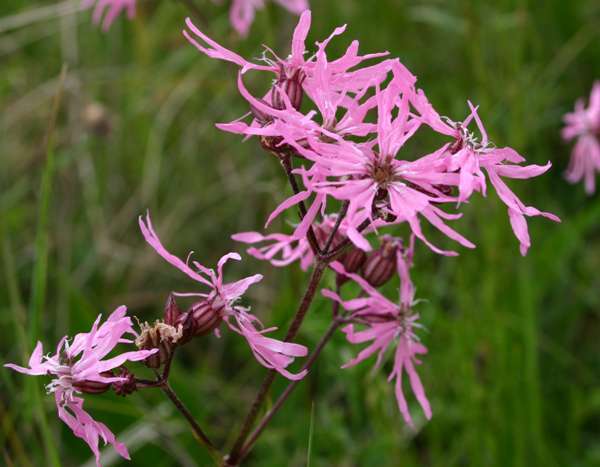 The pictures of Ragged Robin shown on this page were taken in June in Newborough Warren National Nature Reserve in Anglesey, North Wales, Llangloffan Fen National Nature Reserve in Pembrokeshire, Crosshands in Carmarthenshire, Rhydlewis in Ceredigion, and in May in Slovenia.